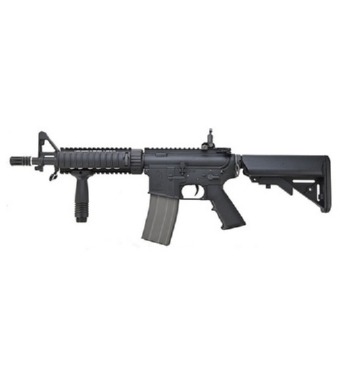 PRODOTTO DALLA ARES, FUCILE ELETTRICO MODELLO M4 FF CQB SHORTY FULL METAL. UTILIZZA BATTERIE CQB TYPE 8,4V-1200mAh CHE NON SONO COMPRESE E CARICABATTERIA 220V-300mA (ANCH'ESSO NON COMPRESO). GUSCIO IN METALLO CON LOGO STAMPATO, TACCA DI MIRA REGOLABILE E RIMOVIBILE SULL'ANTERIORE E POSTERIORE, IMPUGNATURA TACTICAL ANTERIORE RIMOVIBILE, 5 SLITTE IN METALLO PER IL FISSAGGIO DI ACCESSORI.